I’m not entirely sure why this jumped out at me. Maybe because it was originally mackerel, and I’ve always thought mackerel sounds nice even though I don’t like seafood. Maybe it’s because it used gooseberries, which I’d never actually tried before. Maybe it’s just because it sounded so disgusting I wondered why it would be in the BBC Good Food magazine in the first place. Either way, I tried it and I am really glad I did. 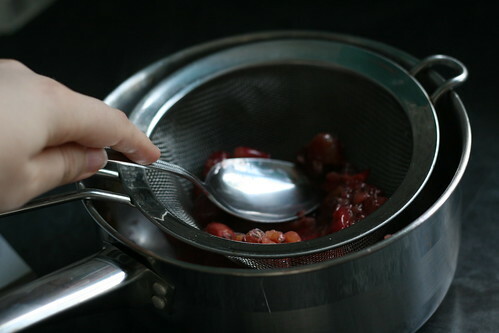 This doesn’t take very long, but it’s quite labour intensive — mainly because you have to squish the gooseberries through a sieve, and that takes a while. But still, it’s worth it. The sauce is delicious and it goes surprisingly well with the fish. Whodathunkit. 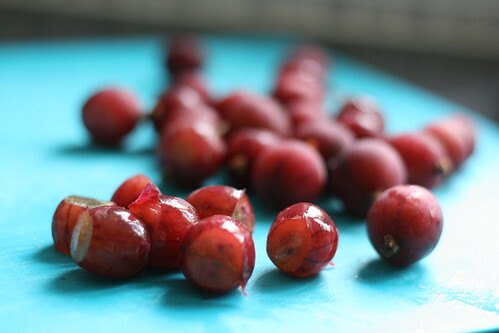 When you get your gooseberries, top and tail them (aka, chop off the tops and the bottoms where there are little stems). Gooseberries were in season when I made this, but the only place I could get them was Sainsburys. I’m not sure if that says something about supermarkets, the teeny-tiny town I live in or just the demand for gooseberries. But when you get them buy a few packs, because they’re very very nice. Preheat your grill to hot. Then you need to put the gooseberries in a pan with the lemon juice and the sweetener. 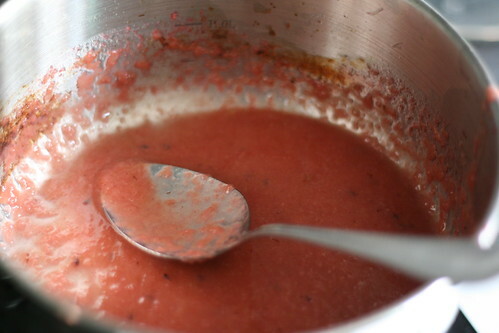 Stir everything so it’s mixed, then put the lid on the pan and let them simmer for five minutes. 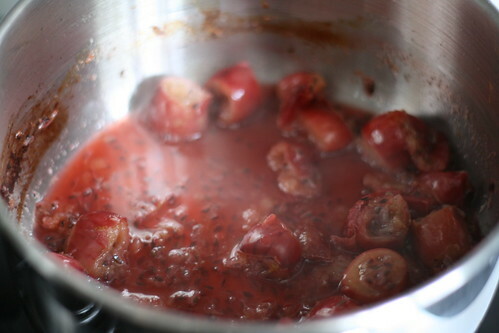 Every 30 seconds or so, stir the mix again so the gooseberries don’t burn. It’s a bit of a faff, but at the end of the five minutes you’ll have a deliciously sweet smelling mix that looks a little like this. Then beat in the low-fat spread/butter until you get a sauce like this. You’ve got your sauce; now to cook the fish. 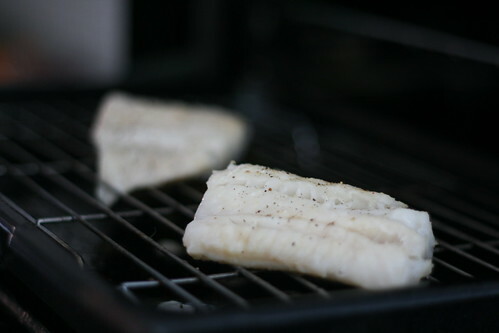 Keep the sauce warm whilst you spray the fish with a little Fry Light, grind over some black pepper and grill it for three minutes on each side. You could probably push the sauce through the sieve whilst the fish was cooking. 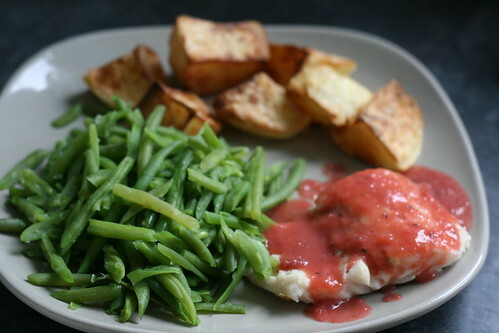 Then you just have to serve the fish with the sauce spooned over the top, along with the potatoes and green beans. New potatoes are best, but I’ve used roast here and they work just as well. Really, really lovely meal. The sauce is gorgeous. I used it on some crushed up meringue and raspberries later in the week as well; it works with sweet just as well as the fish. I was actually surprised it worked so well with the fish, I thought it would taste horrid.